In solidarity with communities blighted by opencast coal mines in the UK and across the world, Reclaim the Power and Bristol Rising Tide are calling for a series of actions against Aberthaw Power Station in South Wales. Mewn undod gyda chymunedau difetha gan pyllau glo brig yn y DU ac ar draws y byd, mae Adennill y Power a Bryste Rising Tide yn galw am gyfres o gamau gweithredu yn erbyn Gorsaf B?er Aberthaw yn Ne Cymru. The environmental movement in the UK won the battle against new coal fired power stations in 2009. But old coal remains stuck in the system with seven existing coal-fired power stations still churning out huge carbon emissions every year. Coal is a dangerous fossil fuel that we cannot continue to burn if we are to stop runaway climate change. The government has recently begun its consultation on phasing out unabated coal by 2025. Nine coal power stations have closed since 2012. A key driver for this process has been EU legislation on air quality. Brexit potentially puts this in jeopardy as the government will be minded to replace EU legislation with much less stringent air quality regulation. “Until we win” was the chant that rang out from the occupation of Ffos-y-Fran opencast mine in South Wales last in May 2016 as 300 people from Reclaim the Power shut the mine in a day of action. 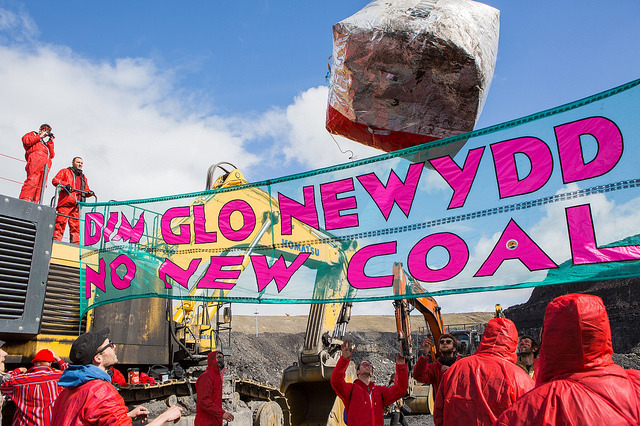 The coal from that mine and a proposed new mine at Nants Llesg feed Aberthaw power station. Without Aberthaw, there is no market and the mines close. Aberthaw has been breaking European air pollution limits since 2007, emitting more than twice the ‘permitted’ level of toxic Nitrogen Oxide (NOx), as well as Particulate Matter 2.5 and other pollutants. Welsh coal is higher in NOx pollutants than coal from other places, and so in order to support jobs in Welsh opencast mines, the UK government argued that Aberthaw should have an exception to the EU air quality legislation. In September 2016, a European Court of Justice ruling dismissed this argument and began fining the UK government for breach of air quality. This air pollution is responsible for causing asthma symptoms and bronchitis in children, chronic bronchitis in adults, hundreds of hospital admissions every year and low birth weight in babies. (See Friends of the Earth report, Air quality and health impacts of Aberthaw power station, Sept 2016) The pollution affects near by populations in Cardiff, Newport, Swansea, Bristol, Poole, Gloucester, Cheltenham and other places across the UK and abroad. In response to the European Court of Justice ruling, Aberthaw owner RWE (who also own Npower) said that it plans to reduce its consumption of Welsh coal, maybe completely, and reduce its operating hours from March 2017. In place of Welsh coal, the power station would burn imported coal. This is likely to come from Russia and Colombia, where the attacks and displacement of local people and trade union organisers amounts to cultural genocide. If Wales were to emulate Scotland’s level of ambition on renewables, the power generated by Aberthaw power station could be replaced by renewable energy instead, and create 1,500 jobs along the way. (source: Ibid, p.24) We don’t require dirty, polluting power stations to provide for our needs. RWE are considering their options as to what to do with this power station due to the European Court of Justice ruling. Changes are expected to be implemented from March 2017 which are likely to include vastly increasing the use of imported coal. The power station is making local people sick, and causing climate change. There is no time to delay. There are currently eight operating coal-fired power stations in Britain. Aberthaw is the low hanging fruit: a win that could knock the confidence of investors in the other stations and create a platform to talk about the future of coal in the UK. The government’s coal phase out consultation ends on 1 February 2017, which may or may not be relevant for some affinity groups. With a rolling series of actions, enacted sequentially rather than all at once, we can increase the pressure on RWE. Affinity groups are asked to stick to the action agreement. Affinity groups from across the country can be accommodated in neighbouring cities. Trainings, action ideas and mobiliser talks can be provided. Get in touch with info@reclaimthepower.org.uk for more info.